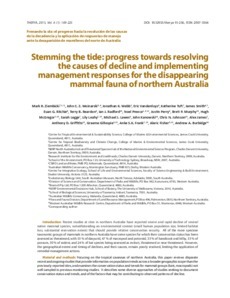 Recent studies at sites in northern Australia have reported severe and rapid decline of several native mammal species, notwithstanding an environmental context (small human population size, limited habitat loss, substantial reservation extent) that should provide relative conservation security. All of the more speciose taxonomic groups of mammals in northern Australia have some species for which their conservation status has been assessed as threatened, with 53 % of dasyurid, 47 % of macropod and potoroid, 33 % of bandicoot and bilby, 33 % of possum, 30 % of rodent, and 24 % of bat species being assessed as extinct, threatened or near threatened. However, the geographical extent and timing of declines, and their causes, remain poorly resolved, limiting the application of remedial management actions.